“Amsterdam, in 2003,” Chrístõ answered. “This is early 21st century,” Chrístõ reminded her. “They’re just starting to worry about that. All of those lovely old buildings are there to be seen, though. Come on. Let’s go and explore.” He pulled on his leather jacket over his usual black shirt and jeans and turned towards the door. Julia, in a skirt and t. shirt with a cardgan and comfortable sandals was ready to join him. Hext reached out to take Romana’s arm as they formed two couples. Romana was in a smart linen skirt suit and blouse, and Hext in slacks and a sweatshirt. They all looked right for this period and this place. The TARDIS had disguised itself as a disused newspaper kiosk in Dam square, a big, bustling public area, bounded by busy roads and tramlines along which trams rumbled at regular intervals. Romana found it all a bit too busy. She was unused to cities, having been cloistered in the Sisterhood for so long. Hext and Chrístõ took it in their stride. Julia enjoyed it thoroughly, pointing out the tourist attractions around the square. She sighed happily to be in such a lovely place. It was early autumn and the trees were starting to turn to colours that complimented the warm colours of the buildings. Chrístõ knew she was wishing they were there to enjoy the sights like the tourists around them. The necessity to complete each part of this mission and then move on meant that they had so little time to breathe in the air of each new place and get used to being there. He promised himself he would bring her back when all this was over and they were free to choose where they wanted to go. “Your father could have been pursuing somebody involved in those illegal activities,” Hext pointed out. 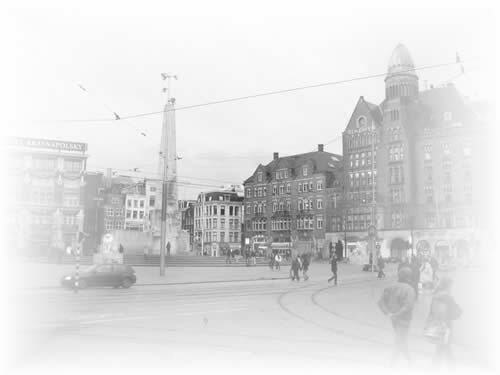 The pursuit of Chrístõ’s theory brought them from Dam Square along the Damrak, and Julia was the one who informed them that Dam Square originally was built upon a huge dam across the Amstel, which was later re-routed through canals. The Damrak was a road built on a partly filled in canal and used to be the heart of the financial district of Amsterdam where the name conjured the same ideas as “Wall Street” did to Americans. “I like history,” Julia added when she caught Chrístõ’s smile. “Only the ones you’ve given me,” she replied, touching her pendant with the six small but very finely cut stones that represented the constellation of Kasterborus. She was wearing diamond stud earrings that he had given her, too. Small gems, a fraction of a fraction of the family wealth, but a down-payment on the ones he intended to give her when she was older. Hext gave Chrístõ a small fold out leaflet. It was very glossy and prettily designed and advertised a special diamond exhibition. “It’s beautiful,” Julia agreed as she looked at the photograph of the said diamond on the front of the leaflet. She touched her own pendant again and smiled. She was a girl who wore diamonds every day. She might not be an expert, but she knew what she was looking at must be very special. “It’s Gallifreyan,” Chrístõ said as he and Hext looked at each other and the same thought came to them at once. 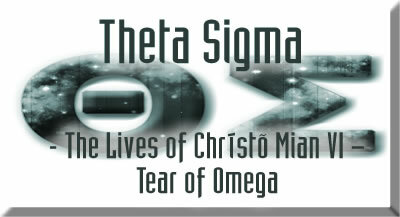 “It’s the Tear of Omega,” Hext added. They all looked. There were several other views of the magnificent diamond, as well as an inset that showed a close up of one of the facets. A symbol had been expertly cut into the shining surface. The leaflet explained that it was a special identifying mark carved by the original stone cutter to indicate just how unique it was. “Same here,” Chrístõ and Hext both agreed. Their shared heritage as young Gallifreyans was invested in such treasures of their world. They all looked at each other and realised what this discovery meant to them all. The Diamond Centre was a tall, multi-storied building of warm red nineteenth century brick with lots of gables and verdigree-covered domes around its steep tiled roof. The fact that the sign over the entrance said “Amsterdam Diamond Center” in American English said something about the influence of the USA on that industry worldwide, as did the fact that diamonds were priced, even here, in US dollars. The centre was part diamond cutting factory, part very exclusive shop, and part gallery of magnificent collections of diamond jewellery. Getting in was rather more difficult than usual because the security staff were checking all of the visitors as they entered. Handbags were examined and they were all subjected to a discreet but thorough body search. He could have just accepted a receipt for it and collected it later, of course, he reflected as he waited for Romana and Julia to be passed by the female guard. But he didn’t like being parted from his sonic screwdriver, and besides, it WAS alien technology. It shouldn’t be tampered with by humans. The four joined the line of visitors walking around the demonstrations of diamond cutting and polishing and a tourist guide explaining about the difference between industrial diamonds and fine jewels, about carats and colour, luminosity and so on. Chrístõ had seen the cutters and polishers of the Lœngbærrow family workshops at their trade and had even tried it for himself once, though he lacked the patience for such a careful art. Even so, he found it interesting to watch it being done and appreciated the effort that went into turning a rough piece of diamond into a sparkling gem. He admired the displays behind glass of magnificent sets of jewellery – necklaces, brooches, tiaras. “What would I do with them? 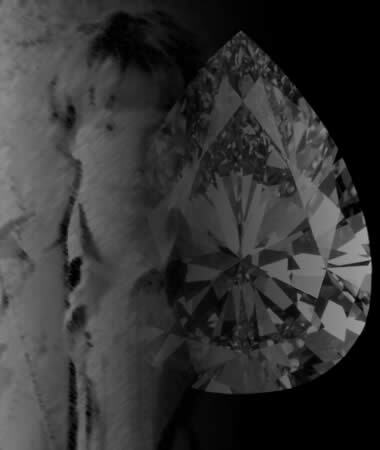 Have my own exhibition?” She laughed and slipped her arm around his waist as they moved in the line towards the special exhibition room where the Van Der Saar Diamond was in a glass case, lit so that its facets were highlighted to perfection. There were information panels as they entered about the history of the diamond, from being found in Natal to now. “Well, that’s very nice of her,” Chrístõ said. “But I’m sorry. It’s not hers to sell. It really is the Tear of Omega.” He held his sonic screwdriver in the palm of his hand, concealing the pulsating blue light that indicated the presence of a non-terrestrial mineral. At the same time he looked at a screen beside the display case. A microscopic camera with zoom lens was focussed on that special facet with the Omega symbol etched into it. Looking at it enlarged he recognised that it was cut with the sort of laser that could only have been made on Gallifrey. Here in Amsterdam, downstairs in the demonstration room, he had seen some very good lasers, but nothing good enough to do that without smashing the diamond into useless fragments. Chrístõ half turned and looked into his father’s deep brown eyes in yet another new face. He looked middle aged, still, but at least five hundred years must have passed since he saw him last. It was him, though. He recognised his psychic ident at once, and his father’s perplexity as he failed to read his. “Let’s go,” he said, signalling to Hext and Romana to follow him. 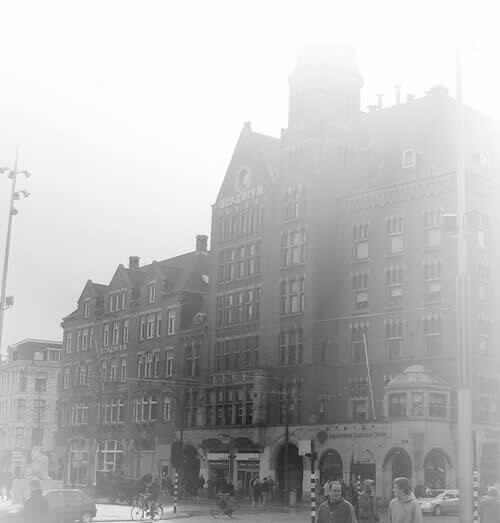 They walked back up to Dam Square and along the road that bordered it at the south side and then along two smaller streets of the charming, old fashioned Dutch houses with their decorated gables and long, tall windows that Julia loved looking at. 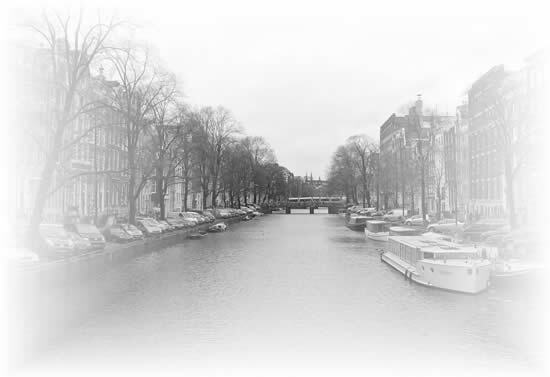 They came presently to The Singel, the innermost of the horseshoe shaped canals that bounded the old part of Amsterdam city, the Amstel itself closing the two ends. Chrístõ Mian led them down onto a beautifully painted narrowboat. Chrístõ noted that it was called the Dutch equivalent of Lady Lily. This was still at least a thousand years and two regenerations before his father and mother met. Lady Lillianna D’Alba D’Argenlunna was still his father’s only taste of deep love. It was a strange sentimentality for a CIA agent, but Chrístõ found it comforting. It was a sign that this incarnation of Chrístõ Mian was still the man he knew and loved. “Ours likes to be a boat, too,” Julia said. Chrístõ Mian cast off the lines and the barge began to move. He had obviously programmed it to move along the canal safely, without any hand at the tiller. He came and sat with them as the faint breeze cooled their faces. “Where is your TARDIS?” Chrístõ Mian asked after a quiet few minutes. “Who is Omega?” Julia asked, feeling that was only one secret that the four Time Lords she was with weren’t sharing with her. “Van Der Saar bought it from the thief? Made up the story to give it provenance?” Chrístõ guessed. Chrístõ Mian paused before continuing. “What about the children’s hospital?” Julia asked. “As opposed to…” Julia wondered. Chrístõ Mian looked at Chrístõ and turned to Hext. He hoped he would still feel the same about his father when he was whole, when he was awake and they were able to talk about all of this. He hoped he could still love him, knowing so much about him. Chrístõ, for his part, proved that he didn’t hold grudges, either. He was sociable over dinner, where Chrístõ Mian didn’t refer to any subject that would cause distress, either diamonds or assassinations. Instead he turned his attention to Julia and showed a genuine interest in her dancing and gymnastics. He clearly found her charming, and Chrístõ could hardly disagree with him about that. Much later, five people crossed a Dam Square that was only a little quieter at night time than it was in the day and slipped inside the closed up newspaper stand. None of the tourists enjoying the grandeur of the Royal Palace and the Nieuwe Kerk beautifully uplit in soft lights noticed when the newspaper stand disappeared. It re-appeared inside the special exhibition room of the Amsterdam Diamond Centre, circumventing all of the security systems except the one around the Diamond itself. “I could have materialised over it and we could have taken the diamond and gone,” Chrístõ pointed out before he opened the door. He watched as Hext and his father both checked weapons. Armed robbery! It was hard to believe that they were all three of them the sons of high caste Gallifreyan Houses. Even though the cause was a good one – the Tear of Omega had to be returned to its rightful place – Chrístõ thought there was something distinctly shabby about what they were doing. Romana and Julia looked at all three of them, then without a word they turned and went to sit by the Zero Cabinet, performing the meditative movements that created a calming aura around the Cabinet. Chrístõ turned and looked at his father and waited for his command to open the door. They stepped out into the darkened room. There were low level red security lights around the room and the diamond itself was bathed in light within the case. Chrístõ used his sonic screwdriver to indicate where the silent alarms were that would trip if they did not go carefully. “Perhaps burglary is your forte after all, Thete,” Chrístõ Mian teased as he and Hext flanked him. He used his sonic screwdriver to disable the alarm on the case and then to open it. Chrístõ reached to take the diamond. As his hands closed around it he almost expected it to tingle with some inner power. But it didn’t. It was just a cold piece of rock with aesthetically pleasing light reflecting qualities. He wrapped it in a soft velvet bag and put it into his pocket before he turned around and stepped towards his TARDIS, disguised as a door marked ‘Besloten’ - indicating a restricted area. As he did so, there were shouts in Dutch, to ‘freeze’ and two security guards rushed through the door, their weapons trained on Chrístõ before they noticed Hext and his father either side. Both of them fired at the same time, wounding the two guards in their gun arms. They all three headed to the TARDIS door. As they did so, they saw it shimmer and heard the sound of a materialisation. Somebody, Chrístõ realised with a shock, had materialised another TARDIS in front of his own TARDIS, mimicking the same disguise. He backed away as the door opened and two men with bastic pistols came towards him. A third man stepped out behind them, also armed. He aimed his weapon directly at Chrístõ’s head. All three gunmen were aiming at his head. “Then…” The stranger began to speak, but Hext and Chrístõ Mian proved him wrong. They were faster. The two henchmen dropped to the carpeted floor a fraction of a second after each other, both shot through the head by Hext. The Gallifreyan traitor yelped as his hand was pierced by a bullet from Chrístõ Mian’s gun. Moments later, he was being pushed through the TARDIS door. “What about the bodies?” he answered as he obeyed. Chrístõ picked up the weapons and glanced at the two injured humans. Even an assassin knew better than to kill indigenous bystanders. They would live. They would give statements to the police, identify the thieves. Their testimony would probably be dismissed when they reported that the thieves went through a door that then disappeared. He hoped that was put down to them being in pain from their injuries and it didn’t affect their careers unduly. “I’m sorry,” he whispered as he ran to follow his father and Hext into the thief’s TARDIS. It was very clearly an older model than his own, but one designed for a single pilot with a smaller, more manageable console. Not that it was being taken anywhere now. The thief was on his knees with Hext and his father both training their guns at him. Chrístõ was relieved to see his own TARDIS in default mode standing in the middle of the room. He went towards it, intending to make sure Julia and Romana were all right. Then he turned in shock as he heard a single gunshot ring out around the console room. He saw his father holding the gun and the body of the thief collapsing in a heap. “You didn’t have to do that!” Chrístõ screamed and ran at Chrístõ Mian. His punch connected with his jaw and the older man reeled back in surprise before instinctively responding with a counter punch that left a bruise across Chrístõ’s face. “He was the younger brother of our president,” Chrístõ Mian answered. Hext stepped forward and picked Chrístõ up from the floor. He resisted at first, then came with his friend. Chrístõ Mian went to the controls of the thief’s TARDIS. Now he was dead, the imprimatur ceased to function. Anyone could set the destination. He did so, allowing himself thirty seconds to dash into Chrístõ’s TARDIS before the dematerialisation. Chrístõ did so, but only because that made sense. When the TARDIS materialised on the canal bank, Chrístõ Mian asked him for the Tear of Omega. Chrístõ handed it to him. He turned and walked out. Chrístõ looked at his friends, then ran after him. The sirens of several Dutch police cars and an ambulance for the wounded men converging on the Damrak could be heard on the night air as he spoke. Chrístõ knew he was right. But he was still angry about what had been done. Chrístõ looked at his father. He was holding him in a tight embrace. Any other time he would have welcomed that intimacy. But he was right. There really was a wedge between them. There was a red haze of anger and confusion and he couldn’t reach out to him. “Enough,” Hext was firm. He pulled him away from his father and pushed him towards the TARDIS. Chrístõ went reluctantly. Hext turned to Chrístõ Mian. Hext did what he had to do. Chrístõ Mian, slightly dazed from having a highly emotional conversation wiped from his mind and the memory trigger reset so that he would forget all their names and faces until the next meeting, walked down the canal steps to his TARDIS. The canal boat ‘Lady Lily’ vanished from the Singel, never to be seen on it again. Hext turned, noticing a police car slowing to a stop on the bridge as he headed back to the abandoned car that Chrístõ’s TARDIS had disguised itself as. But the Tear of Omega was going back to Gallifrey. It was something else that would not be seen in Amsterdam ever again, and by the time the police reached the canal bank he would not be there to be questioned about his movements.